Today, in a time when religious people parade their titles and promote their education as if they were badges of godly distinction, someone who calls himself a servant would be shockingly counter-cultural. When people introduce themselves as “Reverend,” “Bishop,” “Elder,” “Doctor,” “Prophet,” or my favorite, “Reverend-Doctor” so-and-so I wonder about their motives. Who are they trying to impress? Others? God? Or maybe it’s a futile attempt to convince themselves they are someone who they truly know they are not. How refreshing it would be for someone to simply say that he or she is a servant of Jesus. What a great and significant credential it would be, perhaps the best one possible. 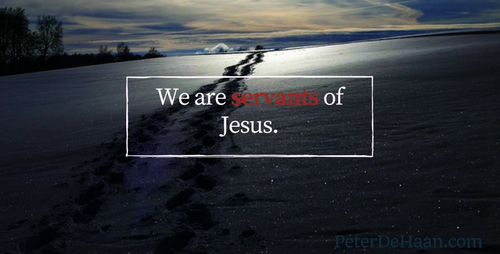 I don’t think titles and degrees mean much to Jesus; he is looking for servants. After all, Jesus himself said he came to serve. Shouldn’t we—as his followers—do the same?